The XJR-9 was the car that finally gave a Le Mans victory to Jaguar in 1988, after years of Porsche dominance. One of the XJR-9's that participated in the 1988 Le Mans 24 hours was bought by the Jaguar importer in the Netherlands. It was displayed in the showroom for years, and it was driven around circuits on a number of occasions. These days it's quietly resting in the garage. In 1995, we paid a visit to the Jaguar importer. We were allowed to do a very detailed investigation of the car, from both an engineering standpoint (as future aerospace engineers with a high interest in race car design), as well as a modelling standpoint. According to the chassis plate, the car was a 'Model XJR-9, Chassis number J12-C-186, Build date January 1988'. According to 'Jaguar XJR Group-C & GTP cars', this chassis started life as the first chassis built in 1986, then an XJR-6. Later it was modified to a -8, and then to -9. Late in its career, it was used by TWR as a development car, on which the Le Mans package was tested. In 1988 it was entered in the Le Mans 24 hours as one of the two IMSA-crewed cars (apart from the three regular Group-C teams). It had number 22, and was driven by Derek Daley (Ireland), Kevin Cogan (USA) and Larry Perkins (Australia). It finished in 4rd place. The car we saw was still in Le Mans trim, with a low wing. It looked flawless, and my guess is that it must have had at least a thorough cleaning after the race. Tamiya, Hasegawa and Arii have issued 1/24 scale models of the XJR-8/9. Hasegawa issued five kits. All kits are curbsides with no engine or suspension. The Arii kit (#712) is a motorized 1/24 scale kit of XJR-8LM. It has a clear plastic body, RE280 motor, battery pack, slick tires, and chassis that is likely made of nylon. It is not meant to be built as a detailed scale model. First on the market, but long since out of production, was a S&S Specialties (USA) detail set. I don't know many details, but it included at least a sizable photo-etched sheet. It was quite expensive too if I'm correct (around 75US$). S&S Specialties lives on as Detail Resources, run by Mike Siegman. Scale Race Cars (USA) photo etched detail set #SRC0039, for Hasegawa XJR-9LM and IMSA kit. Issued early 2004. Studio 27 (Japan) made two decal sheets for the car in Silk Cut markings: a complete set coded DC686C, and a small set coded DC225 that only contained the tobacco logos. They have whiter and more opaque decals compared to the Tamiya originals. Judging from the photo of a built-up model on the Studio 27 site, the decals are different than those of the Tamiya model. The yellow striping is very different, and instead of the complex square purple patches on the engine cover, it has one large solid purple area. Studio 27 also made a sheet for the Castrol car that was raced in the USA, code number is DC206C. Renaissance (France) has issued a transkit (TK 24/106) to make the car as it was in the 1988 24 hours of LeMans for car #'s 1, 2, 3, 21, 22. It includes: a decal sheet (containing numbers, driver names, Silk Cut logos), aerial antenna base, TV antenna base, two ID lights, a sheet of photo etched parts (containing wiper, seat belt buckles, front grills, mirrors, switches, screen clips etc). Museum Collection (Japan) issued three HiTech decal sheets in July 2002: D027 for the XJR-9LM for 1988 and 1989 Le Mans (a complete set I assume), D030 1/24 Silk Cut logos only for 'censored' versions of the XJR-8LM and XJR-9LM. Sheet D028 is for the 1987 XJR-8LM. They were all sold out by September. Apparently normal decal versions were also issued: D103 for the XJR-8LM and 9LM for 1987/1988/1989 Le Mans, a complete decal set plus seat belts in fabric and photo-etch, and D104, with mainly Silk Cut logos for 'censored' versions of the XJR-8LM and XJR-9LM. These are still available. For the record: the XJR-9 can be modified to the XJR-12. Studio 27 (Japan) made two decal sheets this version. Sheet DC212 has decals for the Suntec-sponsored car at Le Mans 1991. Sheet DC213 has decals for the Bud Light-sponsored car at Le Mans 1991. Later Studio 27 issued a curbside multimedia kit of the 1990 Le Mans XJR-12 in the old-style (white and purple) Silk Cut colors (FK2468) and the 1991 Le Mans XJR-12 in the new-style (purple overall) Silk Cut colors (FK2469). Renaissance had a XJR-12 transkit (body, parts and decals) listed as future release TK24/200, but it is no longer listed in their catalog, and was probably not issued. A very good reference on the XJR-9 is 'Jaguar XJR Group-C & GTP cars - A technical appraisal of the V12 cars' by Ian Bamsley; it deals with the Jaguar XJR-5 and TWR-Jaguar XJR-6/8/9. It was published in 1989 by Foulis Motoring Books; ISBN 0-85429-752-9. 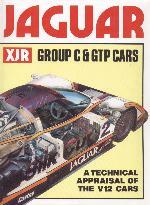 Another book that could prove useful (I haven't seen it) is 'Jaguar XJ Racers' by Unique Motor Books (no date known). It consists of reprints of articles from a wide variety of English motoring magazines. Discussed are the Jaguar XJR-6, 8, 9, 11, 12 and XJR-13 racers as well as the Jaguar XJ220. Illustrated with b/w photographs and illustrations. 72 pages. Softcover. 8" x 11.5". A magazine named 'XJR magazine - the International Jaguar Racing Review' existed for a while, at least in 1989 (issues number 6, 7, 8, 9 are known, plus the 1988-89 Special Issue, the Souvenir Edition USA). It discusses every race and the Jags that participated. Includes large two-page race photos. In 2004, 'TWR Jaguar Prototype Racers' was issued by the Jaguar Daimler Heritage Trust, written by Leslie Thurston. It is a hard cover book with a dust jacket, 192 pages, estimated 350 color photos, and ISBN 0-9541039-1-2. It includes statistics of all individual chassis, but not too many photos of the internals like engine and cockpit (some 1/10 of the photos). I have found only a few modeling articles on these cars. Tamiya Model Magazine No 17 (spring 1989) has an article on the Hasegawa XJR-8 and XJR-8LM, but is not very interesting, it's of the 'and then I painted the body white and applied the decals' type. Scale Models January 1989 has a five-page article that is also rather generic, but at least features 5 pictures of the real thing, including detail pictures. The March 1991 of Car Modeler magazine (USA) included part two of a Jaguar XJR-9 article, but I haven't seen and therefore cannot comment on the contents. MRRN (Motor Racing Replica News, now MRM) issue #14 had a very detailed three page article about converting the Tamiya model into the 1990 Le Mans winning XJR-12. For modelers planning to detail the engine bay completely, I can recommend a booklet called 'Model Detailing Profile: Jaguar XJR V-12 Prototype Sports Car Racing Engine'. This 10 page booklet discusses the complete plumbing of the engine using five pages of text and six drawings. See the Speed Details Publications website of author Stephen Miller for ordering information. Anonymous idiot who copied and posted all the photos from this page without permission - what's the use of that anyway?? The Race Car Walkaround site by Tony Gartshore, with currently already 25 walkarounds! Danish Le Mans site with walkarounds of the Jaguar XJ220c (1993), McLaren F1 GTR (1996) and Dome S101 (2001).